The Nayra Observatory of the Universidad de Antofagasta, operated by the Unidad de Astronomía. The Nayra Observatory (Nayra stands for “eyes” in aymara language) is a unique astronomical facility, inaugurated on 26 June 2013. 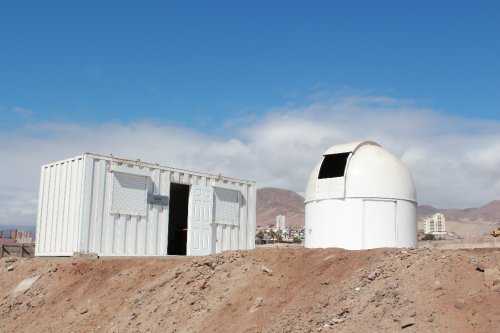 It is located inside the Campus Coloso of the Universidad de Antofagasta and operated by the Centro de Astronomía, with capabilities to perform both daytime and nighttime observations, focusing on the development of teaching, research and outreach. The observatory’s dome, built by Pulsar Optical (England) comprises a motorized glass fiber dome, for the aperture and rotation system. It works with solar energy and the dome’s diameter is 2.7 m. A solid pillar holds the instrumentation while maximize the useful space to allow visitors. 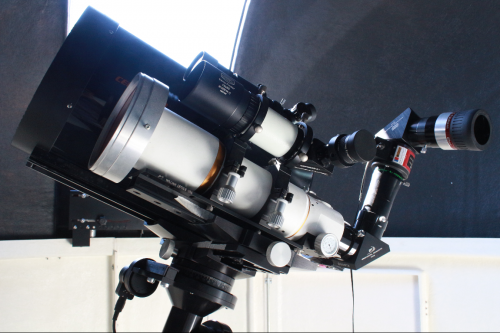 the Nayra facility also include a control room, allowing a remote control of its solar telescope (William optics ZenithStar 80 II ED APO, 80 mm) and ‘stellar’ telescope (Celestron C11, 27,9 cm), supported by a Losmandy G-11 mount. This project was possible due to several donations and combined support, includingv Cerro Tololo Inter-American Observatory, the Gobierno Regional de Antofagasta, the Gemini-CONICYT Fund, Anglo American, Searchlight Observatory and other important institutions involved in astronomy. Solar telescope (80 mm) and ‘stellar’ telescope (11″) mounted at Nayra. ¿Do you want to visit the Nayra Observatory and have the chance to observe through its instruments? You are invited to participate in our monthly public observations cycle, ‘Astrourbano’, inside the Campus Coloso of the Universidad de Antofagasta! During these observations we arrange mini-tours to Nayra, where one of our guides will tell you more about this place and you will have the opportunity to observe interesting astronomical objects. You also can check our observations section!